Love a stunning fragrance? 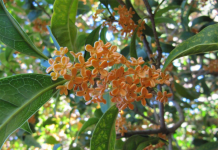 Try Osmanthus “Heaven Sent”. AS the days get longer and warmer, blossom trees are starting to burst in all their glory, none more so than the spectacular Magnolia stellata or Star Magnolia by our front door. 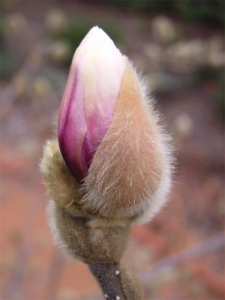 One of my favourite photos is the one here of a bud starting to shed its winter coat and break into full flower. Our Michelia figo or Port Wine magnolia has thousands of small brown buds. While it wouldn’t be grown for its visual impact, when the buds open the gardener is rewarded with its subtle perfume. As with daphne, take a few sprigs inside for a divine fragrance. The plant can be kept to about 1.5 metres or, as in our garden now, three metres by three metres. It’s important with all these trees and shrubs not to do any pruning until a few weeks after they flower. MY first gardening column appeared on February 5, 1986, with the title “Let’s go gardening”. Since then I have written 1600 garden articles and, surprisingly, I am never short of a subject. At that time I spoke about Fraxinus “Raywoodii” or Claret Ash and Fraxinus oxycarpa, the Desert Ash. Remember those distant days when gardens were large enough to accommodate large shade trees? I also suggested at that time planting Osmanthus, still one of my favourites with Osmanthus “Heaven Sent”, growing in our garden. 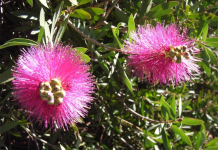 It can be kept at one metre tall by regular trimming for a low hedge or allowed to grow to two metres for a good screening plant. 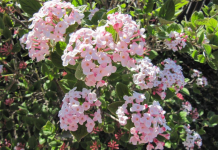 As the name suggests the pure white flowers have a lovely fragrance. Magnolia stellata waiting to shed its winter coat. 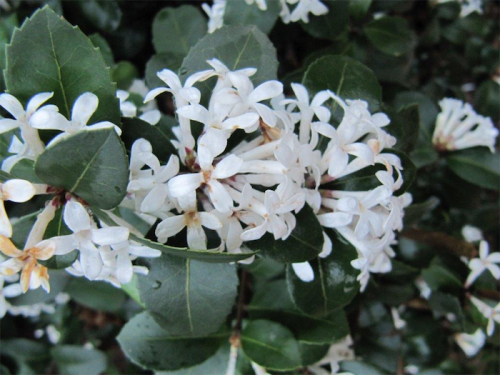 IN 1986 the daphne family was really small with Daphne odora the most common variety. Since then, mainly through Robin White and his specialist daphne nursery in England, there are now more than 200 varieties. Whilst generally thought to have come from China, most come from the hot toe of Italy to the Piedmont north. We have a mere 20 varieties growing in our garden, purchased mainly from Merry Garth nursery in the Blue Mountains. Plant Growers Australia have promoted and supply retail nurseries with quite a number of these daphne, with Eternal Fragrance and Spring Pink being two I recommend. Roses will be in full bud with possibly some early flowers. Give them a boost with Neutrog Seamungus fertiliser, either as pellets or in liquid form. Fuchsias will show new signs of life after winter dormancy. Prune any dead branches and all new shoots to three to four shoots on each stem. Always insert stakes into the ground before planting dahlia tubers. Don’t even think about planting tomatoes unless you have a greenhouse and even then it will need some heating!